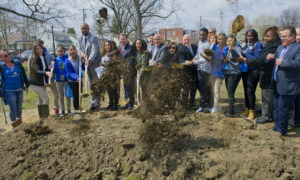 (Camden, NJ) – The Freeholder Board, City of Camden and Cooper’s Ferry Partnership broke ground on significant renovations for Alberta Woods Park located at Fremont Avenue and S. Dudley Street in Camden. The improvements to Alberta Woods Park, which begin this week, are estimated at $775,000 and will include a new and expanded playground and sprayground, along with a graded lawn for sports practices and active recreation. Nash talked about the input that steered the renovations and the expansion of resources for Alberta Woods Park. Congressman Donald Norcross talked about the advances taking place across Camden. The park will also contain a new stage, a new sidewalk that will serve as a walking loop, and new picnic tables, benches and eye in the sky security cameras to improve safety. The park will also feature a new rain garden to capture storm water. Camden Mayor Frank Moran continued that Alberta Woods and the city extensive and growing park system is a priceless amenity for families and children. Cooper’s Ferry Partnership will be managing the renovations of the park. Kim Davis of the Mastery Parent Action Team said the improvements will benefit the community. The Camden County Park System’s 21 parks and conservation areas offer over 2,000 acres of natural settings for picnics, family gatherings, sporting events, beautiful waterways for fishing and boating, a wealth of playgrounds and a variety of ball fields that are close to home. Highlights of the Camden County Park System include the New Brooklyn Park Disc Golf Course, the Watchable Wildlife Trail at Maria Barnaby Greenwald Memorial Park, and the Timber Creek Dog Park. The Park System also includes the award-winning and fully accessible Challenge Grove Park, designed to be enjoyed by everyone regardless of physical ability.